This is the dream that Sarah Musial articulated when she was a senior at Carnegie Mellon University in 2013. 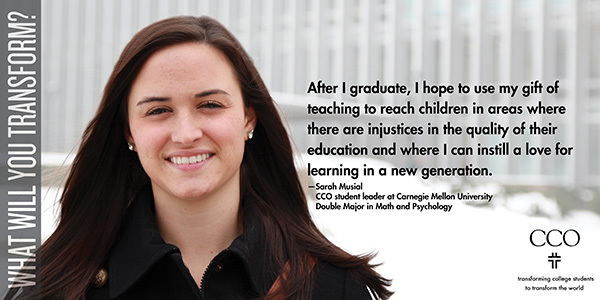 Three years later, she is living out this goal as a math teacher in northern New Jersey. For the past three years, I have had the opportunity to teach in an urban school district in northern New Jersey. The best part about teaching at my school is the relationships I get to form with students. Although getting them to see how fun math can be takes basically all year, I hear from many of my former students about their successes after high school, and it makes everything worth it. I just got a call the other day from a student who moved away after I had him in class. He wanted to let me know that he is about to join the military and will try to visit when he gets out of basic training! My hope is that my students will help improve the culture of the school, so I need to sustain a positive classroom culture. The hardest part has been not letting my frustration with the school system affect the atmosphere of my classroom and how I teach. Getting involved in a church and a small group right away was one of the best decisions I made when I moved to New Jersey. My small group is constantly praying with me for my students. Additionally, I have a roommate and coworkers who share my faith, hold me accountable, and keep me sane every day. After a particularly rough couple of months, one coworker and I decided to get together every morning at 7 a.m. to pray for peace and patience. I’m so thankful for relationships such as this one that have formed as a result of me taking the leap to move from Pittsburgh to New Jersey!